How Many Drops of Essential Oil do you need? That’s it! Why only one? The details are here but let me sum it up. One drop of essential oil absorbs into the clay very quickly. But. It. Takes. A. Long. Time. for it to come back out again! The essential oil becomes trapped in the tiny air pockets which hold it and allow it to gradually, slowly, steadily and consistently escape into the air around it. Only add more oil to the pendant when the aroma wafting off it is very diminished. Then just smear the surface with a bit more oil and you’re good to go! If you consistently add a drop a day, the pendant will become saturated quite quickly, depending on which oils you’re using and whether or not they include carrier oils in the blends. If you find you need to clean your pendant after a time, follow the instructions here! 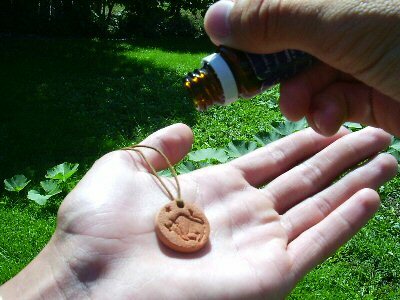 If you want to enjoy Aromatherapy on the go, diffuse with a diffuser necklace made of kiln-fired terra cotta. It makes sense and it costs pennies (which means it makes cents too ;-)! ©2012 Terra Cotta Pendants About the author: Lori Gosselin has worked in network marketing since 1997. In 2003, this passion led to the creation of www.Terra-Cotta-Pendants.com This is one in a series of general info articles about Terra Cotta Pendants. See more here!